Like we weren't excited about the Galaxy Nexus enough already. 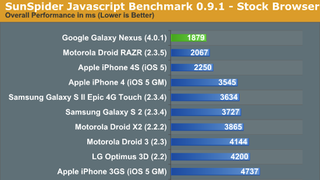 The crew at AnandTech has been busily benchmarking Android's new flagship against Apple's top performer. The results? The Galaxy Nexus is the new king of the hill in some key areas. But don't worry, Apple fans, when it came to the graphics processing benchmarks the iPhone 4S and the iPad 2 both beat the Galaxy Nexus. The Nexus did extremely well, just not as well. This means that, theoretically, gaming performance and other graphically intensive tasks should be slightly better on those iDevices. You can see all of the numbers over at AnandTech.